Zara says to Miraj that Kabir has supporters with him so stop thinking about finishing him. Miraj points a gun at her and says let’s decide good or bad today. Zara puts away his guns and says I am not scared, Kabir’s care has ended my fear, you did well by telling me that Kabir is the danger as now danger will revolve around you Miraj. She smirks and sends thank you to Nilofar. Nilofar thinks that Zara got to know that I sent her the video message, she eyes Zara. Zara leaves. Miraj says what was that? Nilofar says nothing. Miraj says you were right, Zara is clever, I am falling more in love with her. Reema says to Zara that I want to change my votes address as I stay here most of the time. Zara says I am a guest here too, after divorce, I will leave. Reema says when you are sad, it looks like acid being thrown on a flower, please always smile, why did you make me stay today? Zara says I need you. Reema says I an always with you, are you hiding something? Zara says that Miraj is a bad person, he is showing that he is a nice person but he wants to hurt Kabir. 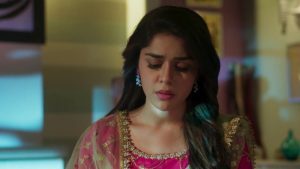 Reema says tell Kabir, Zara says Kabir won’t understand, he is dependent on Miraj, I don’t have proof that Miraj did all that in inauguration ceremony too, Reema says what to do then? Zara says only Ruksaar can bring out Mira’s truth out. Reema says that Ruksaar who tried to kill you? She won’t help you. Zara says Ruksaar have to help me she brought Miraj and Nilofar here… I talked to Miraj and I got to know that he provoked Ruksaar to molest Kabir, he trapped her so she must be angry on him. Reema says she hates you. Zara says she will definitely help Kabir. Reema says you know that she did, forget about her. Zara says I don’t know if I should take her help or not. In morning, Zara offers Hamaz. Zara comes to kitchen and greets Zeenat. Zeenat greets her and says only 20 days are left for you to leave. Zara Says Ruksaar should be here when I get divorced, she wanted me to leave Kabir so she should be here. Zeenat says you are right, your divorced is confirmed? Poor Kabir has to wait for 20 more days, Zara says Kabir might divorce me or he might think he did a mistake and marry me again, if that happens then Ruksaar’s face would be worthy of seeing, Zeenat glares at her. Zara says Ruksaar should be here in both the cases to tell me when she is coming, I will take police complaint back. Zeenat says you are right, it will be a celebration for us sisters when you leave this house and we will wait for that day. She leaves from there. Miraj comes in the kitchen and smirks at her. He says I wanted a cup of tea from your beautiful hands, it will make my day. Zara says my slap will make your day too, were you a jerk since childhood or is it your family? Miraj says those who can make their family shouldn’t taunt others, I have fallen for your bitter tongue, there is a good news waiting for you outside. Zeenat is trying to call Ruksaar but she is not picking up. Zara comes there too. Shahbaz says to Kabir that I think sharia board needs young blood who can make us proud, I talked to Khalid and he said he is not feeling well and wants to resign from sharia board, I suggested him to that if he wants to give a name in his place then he should give Miraj’s name. All are shocked. Miraj smirks at Zara. Shahbaz says I am sure Miraj will fulfill the duties of his position, we have called a sharia board meeting and Kabir I want you to propose this. Kabir says you are right, Miraj is a nice person but if I am resigning then I won’t be able to propose this. Shahbaz says you are right, Zar,a you are a sharia board member and also daughter in law of this house, if you give Miraj’s name in sharia board then I will be really happy, I know nobody would deny you, if you want then you can call Irfan and tell him you want to give this position to Miraj. Zara gets tensed, Kabir sees it and says, Zara, I want to talk to you. Zara glares at Miraj and leaves with Kabir. 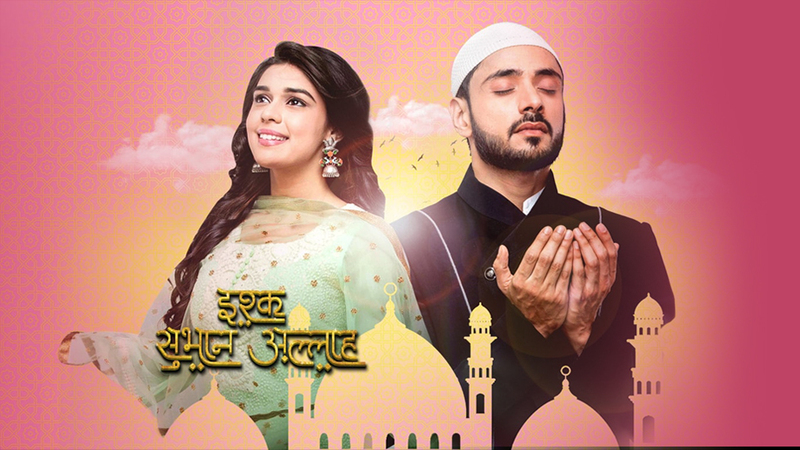 In-room, Kabir asks Zara why she doesn’t want to give Miraj’s name in sharia board? Whats going with it? Zara says because I don’t want Miraj to be a part of sharia board, Kabir asks what’s the reason for that? Zara says forget about me, tell me do you want Miraj to become a sharia board member? Kabir says yes, Miraj asked for help for the first time so it’s my duty to give it to him, he deserves to be there, he did a lot for this city. Zara says you will give him everything today because of Miraj, how can have a tiff with Miraj? Zara says if I don’t give his name then what? Kabir enough, if you can talk to your father then I will find another way but I will give him what he wants because he helped me. He turns to leave but says I don’t know why you do it, when I think I have understood you, you break my day trust, I don’t know why you do it, Zara is hurt to hear it. He leaves from there. Miraj says to Zara what when an insert used to crush it and end it. Zara asks him to be in limits. Miraj says you are going to give my name to Irfan. Zara says don’t have a hope from me. Zara says to Miraj that I will go to Irfan and tell him your truth. Miraj says then I will get angry, I will break things and I can also kill someone. Zara gets scared. Miraj says should I call my goons or are you going? Zara leaves there. Zara comes to Salma and Irfan’s house. She hugs Salma. Salma says you should resign from sharia board, if you were not a member of board them we would not be seeing this day, kabir and shehbaz can forget that day when you made them lose the debate, let’s say that we women are better than men but we should always make men feel like they are better so you can control them. Zara thinks about it and hugs her, she says you are the great mom. Zara says to Irfan that tell me if I can resign from the board? Don’t worry, I have taken the step, just know that I won’t do anything that my conscience won’t allow.